When a girl comes across a recipe for Tanzanian tartlets from the beautiful island of Zanzibar that calls for mango, brown sugar and lime curd with a macadamia, pistachio and coconut crust, there's only one thing to do. Make them and immediately hide them from the human eating machines who tromp around the house in sagged pants and size 11 Timberland's. In the spirit of full disclosure...I know we're all supposed to be eschewing sweets, fat and cholesterol with the advent of the New Year, but alas, this is a recipe you should not turn your back (or hips and thighs) on. My advice, lest you choose to have it in favor of, say, an orange (no disrespect meant to the zesty and beautiful fruit), is that you go for it, but only have ONE tartlet - or maybe two...then skip sweets for the rest of the week. Trust me, you won't be sorry. 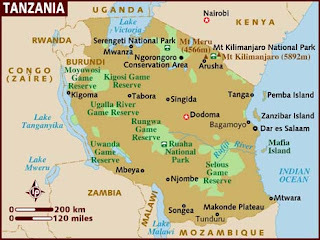 An East African country formed from two sovereign states, Tanganyika and Zanibar in 1964, the country borders Kenya, Uganda, Rwanda, Burundi, the Democratic Republic of Congo, Zambia, Malawi, and Mozambique as well as the Indian Ocean to the east. This beautiful country, which is comprised of 26 regions, including the autonomous region of Zanzibar, is known to have some of the oldest inhabitants in the world, the island of Zanzibar sheltering migrants looking for seasonal fishing from the mainland before the birth of Christ. The country's history of trade with Arabia dates back centuries, as does trade with Portuguese and Indian merchants and the French who who imported slaves from Kilwa. Swahili and English are spoken in the country, with the majority population being Christian, followed by Muslim and indigenous people.Tanzania's spectacular landscape boasts islands, coast plains and highlands. The country has the earth's largest concentration of wild animals, along with protected conservation land and pristine, sandy beaches. It is also home the world's highest snow-capped mountain, Mount Kilimanjaro. A largely aggricultural economy, one of the world's largest and most powerful heat blast furnace capable of forging carbon steel (a natural resouce in Tanzania), was invented in this country and has served as model to other industrialized nations. Cuisine varies greatly from interior to coastal regions. For the most part, food is spicy with extensive use of coconut milk, rice, ugali (maize poridge), chapati (bread), grilled meat, fish, plantain, pilau, okra, spinach, green peas, bean and cassava leaves. On the island of Zanzibar, Arab, Portuguese, Indian, British and Chinese influences are found and coconut, mango, citrus, rice, and nuts are used in cooking. About this recipe: I suspect that this a "special ocassion" recipe, reserved for parties and celebrations, and is not a typical Tanzanian dessert. That said, the ingredients used do reflect many of the staples used in everyday cooking. And, wow ~ if you want to impress or shower someone special with a decadent, exotic treat, this is the one. Enjoy! The crust: pistachios, roasted macadamia nuts, brown sugar, coconut and egg whites ~ shazam! A rich, nutty, coconut crust, zesty, rich lime curd and mango? Yes, please! Combine the macadamia nuts, coconut, pistachios and brown sugar together in a food process and continue processing until the nuts are all finely chopped before transferring to a bowl. Meanwhile beat the egg whites together until they form stiff peaks. Fold the egg white mixture into the nut mixture (Add about a third at a time). When done allow the mixture to stand for 10 minutes. Meanwhile grease about 8 x 10cm tartlet pans (the ones with removable bottoms) and when ready use plastic wrap to press about 1/3 cup of the nut mixture onto the bottoms and up the sides of your prepared tartlet pans. Place the pans on a baking sheet and place in an oven pre-heated to 350 F and bake until the crusts are puffed and begin to brown (about 20 minutes). Take the pans out of the oven and allow to cool for 5 minutes before carefully removing the pan sides. Meanwhile, make the lime curd by whisking together the sugar, lime juice and egg yolks in a large metal or heat-resistant glass bowl. Set this bowl over a saucepan of simmering water (the bottom of the bowl should not touch the water surface) and with constant whisking cook until the mixture thickens and a confectioner's thermometer reads 180 F (82C) - this will take about 9 minutes. Remove the bowl from the heat at this point and gradually add the chilled butter, whisking until all the butter has melted and has incorporated thoroughly into the mix. To prevent a skin press plastic wrap directly onto the curd's surface then allow to cool and refrigerated for about 3 hours, until completely cold. Fill each pie crust with 5 tbsp of the lime curd then arrange the mango slices on top (a decorative fan looks nice). Whisk the jelly in a pan over a low flame until it melts then brush a little over the mango slices. Place the prepared tartlets in the fridge for at least 3 hours before serving. This looks heavenly and tropical, just perfect for a cold winter day. Can I assume that because there is no flour it is also gluten free? Thank you, Laraine! You're right, there isn't one drop of flour in the entire recipe, so I guess it is gluten free. I need to learn more about gluten free cooking and include more of those recipes! Happy New Year! Holy Cow!! Those look delectable! Great job, Sarah!! It looks like we'll be doing Togo around the same time...LOL! That pie looks just divine! ..and mangoes are in season too. woww...Yummy Mangoes are tasty ! !The way you decorated was awesome .. Great job sarah !! why dont you parcel this food to india ?? ?